Fueled by a 3-0 fourth quarter run, Hopedale defeated league foe Northbridge 8-7 after attackman Noah Luccini fought through three Ram defenders to score the go-ahead goal with 1:20 to play. The Blue Raiders (9-9) then won the ensuing face-off, and killed off the final 80 seconds with a combination of precise passing, and hard running around their offensive zone. The win puts Hopedale within a single victory of the first playoff berth in the program's three-year history, and pushes Northbridge (5-8) to the brink of elimination. Luccini's goal finished a 3-0 Blue Raider run that seemingly came out of nowhere for Hopedale. After the Blue Raiders built a 5-2 lead early in the third quarter, Northbridge went on a 5-0 run, sparked by a snipe from senior middie Chandler Brooks. After Brooks scored, he dished out a nice pass to Brendan Morganelli to pull the Rams within one to end the third quarter, and three more goals in the first half of the fourth put Northbridge up 7-5. That's when the momentum swung abruptly back to the Hopedale sideline. After a penalty, Johnny Rainville and Jake Wollensak each scored in a span of 20 seconds, tying the game with three minutes to play. After that, the Blue Raiders' leading scorer took over, dodging in, fighting through the first slide, maintaining possession as he spun to the cage, and finally delivering the game-winning goal between three Ram defenders. "I hadn't really been taking my guy throughout the game, so I decided that would be a really good time to," Luccini said. "I took a couple checks and looked down. The ball was still in my stick, so I just put it away." With two teams fighting for their playoff lives, you might expect tensions to be high. But, add in the fact that Hopedale had surprisingly blown out Northbridge 19-10 less than two weeks ago, after the Rams had beaten Hopedale in the programs' first four matchups by a combined 38 goals, and you have a recipe for an emotional finish. Could a rivalry be budding between these two Mid-Mass foes? Hopedale coach Eric Moxim isn't ready to say that, but he does think his much improved squad is flustering opponents. "What we have seen from teams this year, is something we're interpreting as, 'why are you so good?'" Moxim said. "Which now means, 'you were supposed to be a soft win, so now I'm angry, and now we're slashing...' While I know that's not the best way to express it, deep in there is a feeling that they need to beat us, and we made it hard on them." "We beat them by nine last time, so I think we were sort of already looking toward the next games," Luccini said. "Reality hit us at halftime that we have to get this done before we can move on." Hopedale is one of several young programs taking major steps this year, and the Blue Raiders' improvement has been nothing short of astonishing. Following the overly ambitious three-year model of "first it sleeps, then it creeps, then it leaps," Hopedale has leapt into playoff contention way ahead of anybody's expectations. "Third-year programs, in this division, should not make the playoffs," Moxim said of his team's opportunity. So, how did the Blue Raiders get here, to the door of the state tournament, several years ahead of schedule? Well, obviously, Luccini has developed into one of the region's premier scorers, next to Rainville up front. Also, a midfield headlined by J.D. Waswill, Trevor Wilson and Wollensak has balanced out the Blue Raider offense. Defensively, Hopedale fights as hard as anyone, with pole Michael Foley setting the tone, and goalie Daniel Hollis cleaning things up. Hollis' 15 saves were a big part of Tuesday's win, and the quick-handed goalie will need to have big games against the two potent attacks Hopedale faces next. Both teams know exactly what they must do from here on out to make the playoffs, and neither road is easy. Northbridge's margin for error has been reduced to zero, as the Rams must now defeat Tantasqua, Leominster and Worcester twice if they want to get back to the tournament. Winning for four consecutive games against probable tournament teams won't be easy, which is why today's game was so critical, but the Rams do still control their own destiny. Hopedale, meanwhile, only needs to win one of its final two games, but both opponents will present challenges. 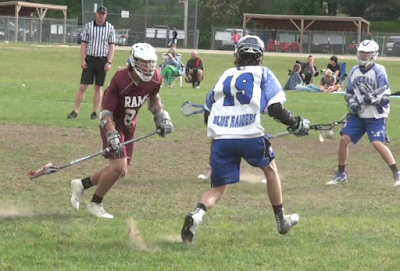 First, the Blue Raiders will travel to Tantasqua Thursday to face a team that defeated them 11-7 earlier this year. Then Hopedale will host St. Bernard's, a squad that defeated the Blue Raiders 8-6 in late April. Obviously, Hopedale will have to turn around one of those results to get into the tournament, and they know it won't be easy. "We're just gonna need a little magic," Moxim said with a smile. "But yeah, if we could get in that would be something special. We're SO close."